This will be a live auction house sale & online bidding sale. Sale to include tools, power tools, electrical supplies, plumbing supplies, storage cases, tool boxes, box lots & more. Box lots & some other items will begin promptly at 9:00 that will be sold to live auction house audience only. Live online webcast auction will start around 9:30. Bid online now until the day of sale as lots close. wrenches & wrench sets, screwdrivers, chisels, punches, hammers, drafting set, torx drivers, ratchets, clamps, reamers, drill bits, tap & die sets, bench vises & other vises, vise grips & clamps, bit & socket driver sets, driver & bit sets, electric screwdriver, electric stapler, electrical tools & supplies, plumbing tools & supplies, storage cases & bins, tool boxes, battery chargers, air sprayer/paint gun, exacto knife & blade set, heaters, magnetic wire snake, UVX radiometer, 4-1 level with laser trac, comalong, fluorescent lights & lamps, soldering iron, hatchets, garden seeders, hole saw blades, hardy hole tool, aluminum mult-functional ladder, Craftsman tool chest, hand forged tin bender & more! Large variety of tools including new merchandise. Preview Thursday, April 4th from 1:00 till 6:00 at 309 Chestnut St. Bainbridge, PA 17502. Online bidders must have their items shipped or pickup Monday April 8th 9:00 till 3:00 or Tuesday April 9th 8:30 till 6:00. If those times don't work, please call 717-618-9727 to schedule a time. Please pick up your items as soon as possible. If your items are not picked up by Friday April 12th we will charge your card on file & ship it to you at your cost. Pick up at 309 Chestnut St. Bainbridge, PA 17502. 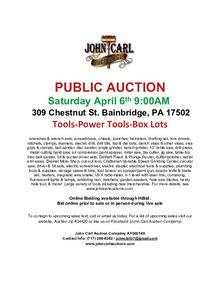 Download "APRIL 6TH TOOL SALE.pdf"
Download "APRIL 6TH 2019 TOOL & BOX LOT.pdf"